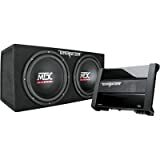 MTX created the Terminator series amplified sub system with one thing in mind: to terminate the competition who make inferior quality loaded woofer systems. They did a great job with this system as they thoroughly tested their TN250/1 Class D monoblock amplifier with the two Terminator 12" subwoofers and matched them in the perfect enclosure. Because they built the enclosure to perfect specifications for the subs and amp combo, they allow you to leave your fear of a bad system at the door and instead enjoy hours of clean, loud bass at an unbeatable price. TNE212D Dual Loaded Subwoofer Enclosure Features: 2 12" Terminator Series Subwoofers Included Power Handling: Peak: 1200 watts per pair / 600 watts each sub RMS: 400 watts per pair / 200 watts each sub 2" Aluminum single 4 ohms voice coil Rubber Surround Polypropylene Cone MTX Audio Logo on Dustcap 48oz. Magnet Frequency response: 37-150 Hz Enclosure Features: Dual 12" Sealed Sub Enclosure 5/8" MDF Solid Contruction Durable Black Carpeting Terminator Logo Embroidered into Carpet Front Dimensions: 14"H x 29-1/2"W x 13-1/2"D1 x 11"D2 TN250/1 Monoblock Amplifier Features: Terminator Series Class D Monoblock Car Amplifier RMS Power Rating: 2 ohms: 200 watts x 1 chan. Max power output: 400 watts x 1 chan. LED power and protection indicators Selectable bass boost (0, 6, 12 dB at 40 Hz) Mono gain control Smart engage auto turn-on circuitry Built-in adaptive cooling fans Fixed low-pass filter (85 Hz, 18 dB/octave) CEA-2006 compliant amplifier Frequency response: 20-85 Hz Dimensions: 13-1/16"L x 10-3/16"W x 2-1/4"H 4-gauge power and ground leads recommended.